Movie fatigue is certainly a possibility, but another might be the plethora of choices available. 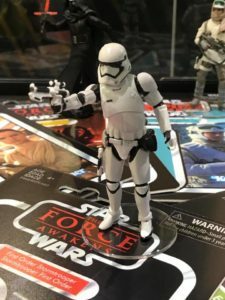 Not only is Star Wars being marketed heavily, but the Marvel franchise, and so many other current film and cartoon franchises are vying for customer attention. I don’t think the last Transformers movie line did all that well, but there are two or three OTHER Transformer lines available in stores right now. Based on what I see locally, another problem might be (at least with the 6″ SWB line) that perhaps The Force Awakens figures were over-ordered. The last few waves, including The Last Jedi figures, have been a bit harder to find, as the stores in my area are still filled up with Constable Zuvio and the like, so it seems like they’re not ordering as much of the newer waves.